So get this week's important news by watching the 7-minute video here right now. Last week Google updated its YouTube Creator Guidelines, which finally gives YouTube content creators a clear understanding of what is 'Ad-Friendly' content. Google has provided more detail on why some existing content is ineligible for ads, and a detailed explanation of what makes future content “Ad-Friendly”. The new guidelines come just a couple of months after companies pulled their ads from YouTube because their ads were showing up alongside extremist and violent content. This has caused many YouTuber’s ad incomes to plummet, and even see many prominent YouTube channels leave the platform entirely. Be sure to check out the guidelines if you have any plans to monetize your YouTube videos. In sombre news this week, 30-year-old Pakistani Taimoor Raza was sentenced to death under Pakistan's blasphemy laws. It's the first time someone has been handed down the death penalty for social media content. Taimoor Raza allegedly made the derogatory remarks against the Prophet Muhammad, his wives, and companions. Insulting the Prophet Muhammad is a capital offense in Pakistan. Human rights activists from all over the world have expressed concern over the sentence, but Facebook is yet to comment on the case. Posting your content on Facebook allows you to reach a wider audience than traditional marketing channels. This sentence is a harsh reminder that different places of the world have different values, and may be offended by your content. In extreme circumstances, it may be illegal for them to view your content. Snapchat's user growth has plummeted since Facebook launched their Stories format. To combat this, Snapchat announced a range of new tools to seduce advertisers over to their platform and place ads on Snapchat. Advertising on Snapchat was previously only available to big brands with big marketing dollars, meaning it was impossible for most small to medium businesses to reach this popular social media platform. Today they've rolled these new tools out to everyone - meaning that if you’re watching this video you can now reach this huge untapped online audience. Spend as much as you want - there's no minimum spend! This tool lets you bring in existing horizontal videos and trims them for the vertical format. It also allows you to buy ad space through the Ad Manager with one click. 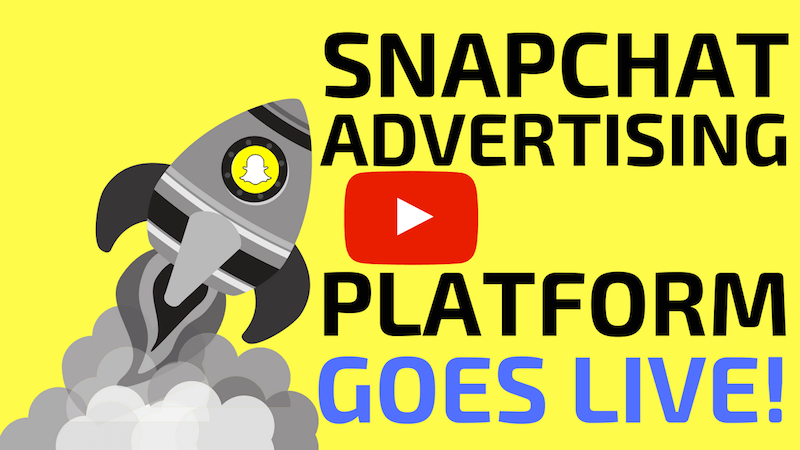 If you’re looking for more traffic, and are targeting a younger audience, it's never been easier to place Ads on Snapchat. Now's the time to use these new tools, put compelling video ads in front of future customers, and grow your business. In this week’s SEO News, Search Engine Land published their 2017 Periodic Table of SEO Success Factors. Founder of Search Engine Land, Danny Sullivan, says the goal of this resource is to help publishers focus on the fundamentals needed to achieve success with Search Engine Optimization. Each factor on the table is given a score from 0 (not important) to 3 (crucial). If a factor has a negative score, it’s deemed to be capable of hurting your website rankings. 1. Site speed: Fast loading content is something Google is pushing hard for, evidenced by their Accelerated Mobile Pages (AMP) format they’ve been implementing. 2. Mobile friendly: More than 50% of all searches come via mobile devices, so being mobile friendly is critical. 3. Direct Answers: Featured snippets are becoming more and more common when a user enters a question into Google, so it’s important your website supports this format. Interestingly enough site age, search history, author identity, and Google+ social shares have all had significant weight decreases. Quality Content continues to be a strong factor, with it having an importance factor of 3 - the highest available!